Last Sunday, 20 May 2018, saw the start of this year’s Rás Tailteann, Ireland’s only UCI ranked cycling event. The 8 Day race which takes in some of the most beautiful roads in Ireland, took the route from Drogheda – Athlone – Tipperary Town – Listowel – Glengarriff – Mitchelstown – Carlow – Naas – Skerries. En route, the riders powered up some famous climbs such as, Molls Gap and the Healy Pass in Kerry and Glenmalure and the Wicklow Gap. Ray Cullen, Cathal Purcell, Jamie Blanchfield, Daryl Kearns and Matthew Sparrow took to the start line amongst the best riders Ireland had to offer together with a number of professional teams from all across Europe and the United States. The first three stages were relatively relaxed in comparison with other years. The Swiss national team were controlling the race as one of their riders was in the yellow jersey. It was on the fourth day, when the race went into the Kerry Mountains, that large time gaps began to appear in the peloton. The lads were all going really well, Ray had been leading the A2 category since the beginning of the week and was not giving that up for anything and the team were in joint first place in the County Team Category. On day six into Carlow, we unfortunately, lost Jamie to illness. A large number of riders across the whole peloton were affected by it. One American team had to withdraw completely. Losing Jamie was a big blow to our County Team contention but we still had Ray leading the A2 category and extending his lead day by day. By the time the race hit the Wicklow mountains, fatigue was setting in and the peloton splintered into about eight groups but our lads were still persevering and pushing on. The final day was tough with only 35 secs separating the whole top 10. At the finish line, the Swiss rider, having held the yellow jersey for the whole week lost it to one of the American Delta team riders by 1 second. Our own Ray Cullen stormed to victory in his A2 Category with 17 minutes to spare. 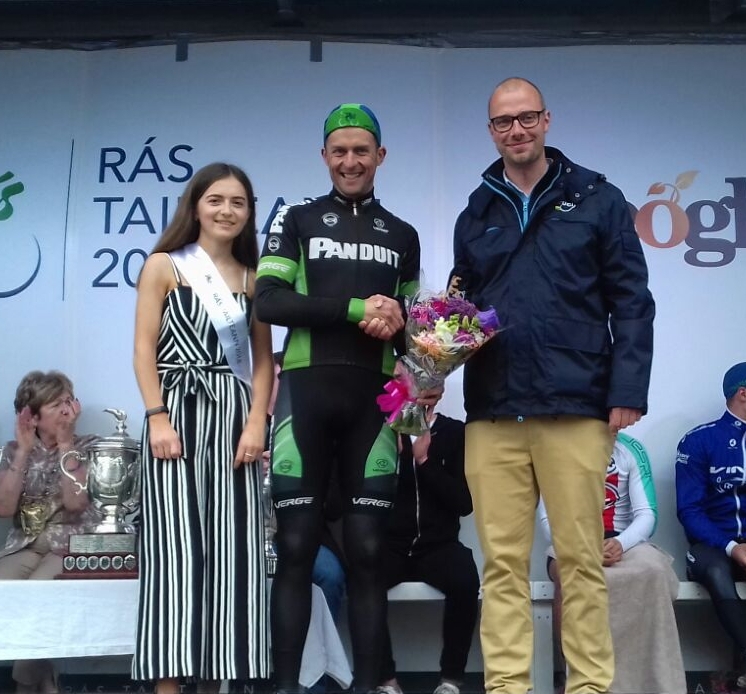 This was Ray’s first Rás and even though lining out on Day 1 is nerve-wrecking, the stages never fazed him and he so deserved to be on that podium in Skerries yesterday. In other news closer to home, the Clonmel CC 2 Stage GP took place yesterday. We had a number of riders signed up for the event which was taking in 2 road stages. Stage 1 required the riders to complete 4 laps of a 12.5km circuit around Marlfield, Knocklofty and Clonmel. As a result of slippery conditions, the biggest gap any breakaway got was 40 seconds. 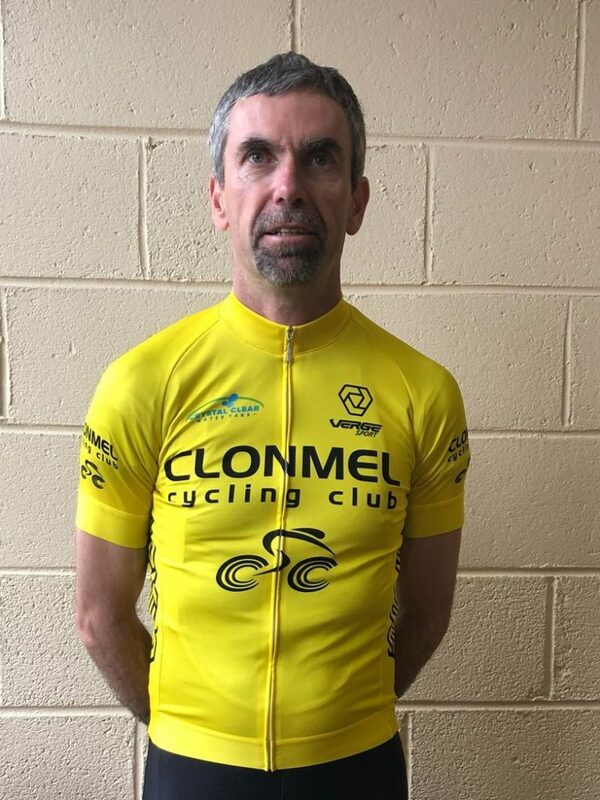 Martin O’Loughlin moved himself into position on the front of the group with 1km to go, he kept it steady on the descent into Marlfield and then kicked with 200m to go to win the stage by two bike lengths. This put him in the yellow jersey for the second stage in the afternoon. The Panduit Carrick Wheelers lads controlled that race well. Tom O’Connell put in a huge effort from Kilganey to Kilsheelan and back up to Bulmers. John Dowley took over from Ferryhouse to 1km up the Mountain Road, from here Kieran Condon took up the baton and set a pace that discouraged attacks. It all went completely to plan until 600m to go, when two riders got a gap. O’Loughlin left it a bit late to close the gap to them and the line came all too fast and he ended up taking 4th. on Stage 2. Combining both stage results, O’Loughlin had to settle for 2nd. place in GC as it came down to a count back and the overall winner had finished ahead of him on Stage 2. Well done to the whole team, a great effort was put in, by all accounts, it just was not to be on the day.